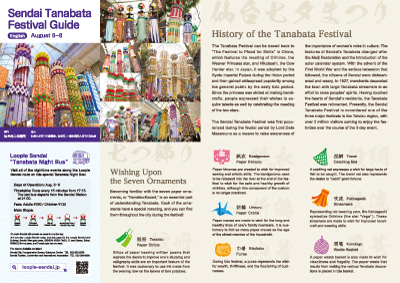 What is Sendai Tanabata Festival? Sendai Tanabata Festival has been passed down through the generations as a traditional event that dates back to the era of Date Masamune, the first lord of Sendai Domain. Today, the festival is known nationwide for its elegance—derived from an ancient Japanese star festival—as well as its gorgeous decorations. Tanabata festivals are traditionally held throughout Japan on July 7, a date based on the old Chinese calendar. The Sendai Tanabata Festival, however is held from August 6 to 8, based on a calendar that is one month later than the old Chinese calendar, in order to keep to the seasonality of the old festival. During the festival, the entire city—including central Sendai and neighboring shopping districts—is filled with colorful Tanabata decorations. The festival is visited by more than two million tourists every year. August 6 to 8: 11 a.m. to 9 p.m.
*The map shows approximate locations. 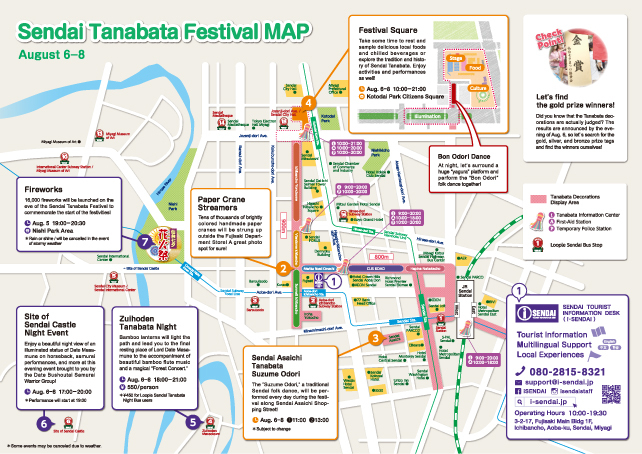 Roads around Sendai City will be congested during the Tanabata Festival. Please use public transportation (subway, bus, and taxi) as much as possible. Gorgeous bamboo decorations are displayed in an area stretching from Sendai Station and Chuo-dori Avenue to Ichibancho Arcade. In addition, simple, traditional bamboo decorations can also be seen in neighboring shopping districts. Workshops for creating Nanatsu-kazari decorations and tanzaku votive notes, Tanabata dance, on-stage events, a food court where you can enjoy Sendai’s delicious cuisine, fantastic illuminations inspired by the Milky Way, and much, much more. Copyright © SENDAI CHAMBER OF COMMERCE AND INDUSTRY. All Right Reserved.